The popularity of digital cameras and photographs has boomed with the advent of the new century, as you can print your photos out on your home computer. Learn the jargon you need to know to take the perfect photo! Digital Cameras are popular now. They are easy to use, and you can copy the files to a computer and printout the picture on your laser printer. But if you are buying a digital camera, what are you getting? Below are some of the important terms that will help you work with your digital camera. A/D converter: The A/D converter works with the charge-coupled device, converting the information from the CCD into digital format. Automatic White Balance: AWB is an option that automatically sets the brightness of the image. Burst mode: Burst mode is done by just holding down the shutter button so continuous pictures are taken. Charge-Coupled Device (CCD): It's a tiny light-sensitive computer chip that gathers image information using electrical charges and converts it, with the A/D converter, to digital format. Auto Exposure (AE): AE automatically sets the exposure in three ways according to the available light conditions. They are programmed, aperture priority or shutter priority. With programmed the camera automatically adjusts both the aperture and shutter speed. With aperture priority, the camera automatically adjusts the shutter speed and you manually adjust the aperture. With shutter priority, the camera automatically adjusts the aperture and you manually adjust the shutter speed. Compression: Compression is the digital process of breaking down the analog parts of an image into smaller digital parts; A 1 meg file may be compressed to 800K saving about 224k of storage space in the process. Continuous AutoFocus (AF): When continuous AF is activated, the autofocus is on, even when the shutter button isn't pushed. Digital zoom: A digital zoom makes the center half of your picture bigger by cutting off the outside. As the image gets bigger, it loses its sharpness. Digital Single Lens Reflex (DSLR): A DSLR camera is a digital camera that allows you to change the lenses. It's a fairly new development and is used mostly by professionals. Flash: The flash lighting in digital cameras is built-in. There are several flash modes. Autoflash fires automatically in low-light conditions. Fill-flash fires regardless of the amount of light available. Pixel: Pixel is a word that comes from "picture elements." It is the smallest element, or dot, that makes up an image. The number of pixels determines the resolution. Resolution: Resolution refers to the number of pixels in an image and the more pixels the sharper the image. It is usually expressed as a 4:3 ratio for example, 800 x 600 or 1600 x 1200. Megapixel: A megapixel is equal to 1 million pixels. Image sensor: The part of the digital camera collects the image data let in by the aperture is the image sensor. Jpeg: This is a standard for compressing image data developed by the Joint Photographic Experts Group; that is where the name JPEG comes from. JPEG is not a file format, it is a compression method that is used within a file format. You can store images to be reprinted later, or shown on a computer. TWAIN: In order to exchange information between applications and devices like scanners and digital cameras a common set of standards called twain is used. Memory cards/Stick: Memory cards provide extra storage for images. They can range from 4MB to 4 gigs They are also known as a memory stick. Digital Zoom: Provides digital magnification of the center at a range of 50% of an image. But it will not generate a sharp image because the new "zoomed" image has been modified. Optical zoom: An optical zoom that actually moves in different angles allowing telephoto or close-up pictures. It's similar to Digital zoom but it doesn't magnify the center of the picture only. Orientation sensor: An orientation sensor is a feature that can tell when you turn the camera sideways to take your picture, the finished image is adjusted to the correct orientation. Shutter: The shutter opens and closes to allow light to hit the image sensor. Flash memory: Flash memory is the removable memory cards that record images in a digital camera. The data isn't lost when the power is off. USB port: The USB (universal serial bus) port connects your computer to the digital camera or card reader; usually it is a cable with to USB connections at the end. 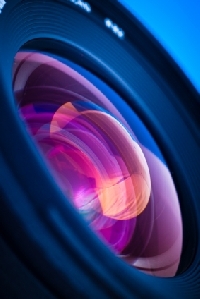 Zoom Lens: A zoom lens provides focal lengths in the 35mm-105mm range. Pictures can be taken from a variety of distances, up close to wide angle. Red-eye: Red-eye dots occur on a picture when the light of the flash hitting the blood vessels at the back of the retina. If the flash is close to the lens, red-eye will occur. Red-Eye Reduction Mode: To eliminate red-eye an extra flash is fired before the main flash is fired, that makes the pupil close before the actual picture is taken. Getting started in digital camera photography can be daunting because the techniques for taking pictures are different. To get you started here are some digital camera definitions and terms that will help you in the process. How many lenses does an amateur photographer need?